Preheat oven to 325°F. Butter 8 x 8-inch baking pan and line with parchment paper. Toss the oatmeal, almonds and flax seeds in large bowl. Melt butter in small saucepan over medium heat. Add honey, brown sugar and salt and bring to simmer. Remove from heat and stir in almond butter and vanilla, mixing until blended. Pour honey butter mixture over oatmeal. Add dried fruit and stir until well combined. Pour mixture into prepared pan. Wet your fingers to prevent mixture from sticking to them, and firmly press mixture evenly into pan. Bake for 25-30 minutes, or until light golden brown. Cool for at least 2-3 hours before cutting into 8 bars. 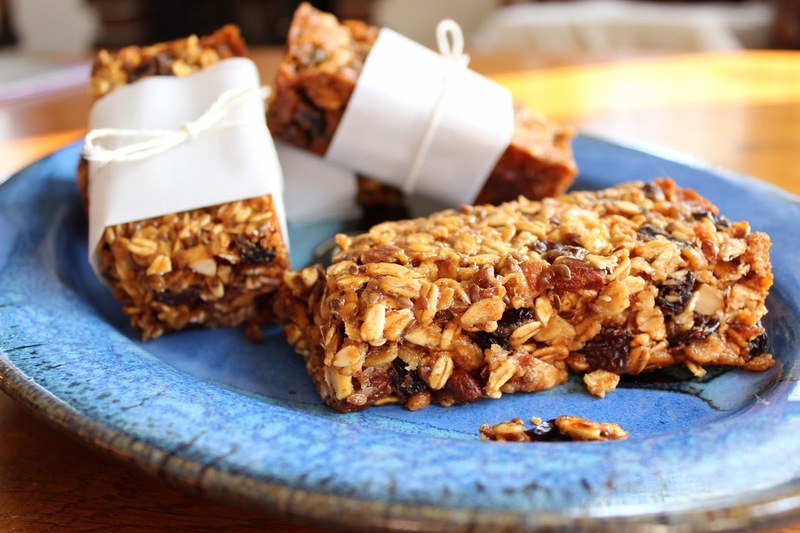 Wrap each granola bar separately for storage.